Common foods that are naturally radioactive include potatoes, bananas, sunflower seeds, many nuts, and kidney beans, among others. Among these, Brazil nuts are the most radioactive by far at 6600 picocuries per kg or about 1.875 BED (banana equivalent dose). 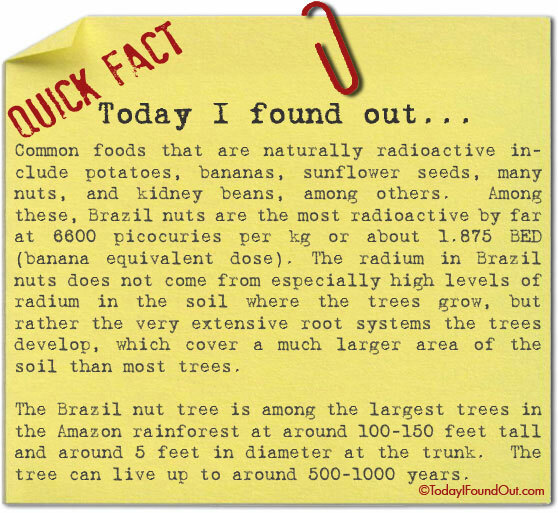 The radium in Brazil nuts does not come from especially high levels of radium in the soil where the trees grow, but rather the very extensive root systems the trees develop, which cover a much larger area of the soil than most trees. The Brazil nut tree is among the largest trees in the Amazon rainforest at around 100-150 feet tall and around 5 feet in diameter at the trunk. The tree can live up to around 500-1000 years.